Top quality, great value golden rum from Barbados! Doorly's 5yo is a blend of rich pot still and elegant column distilled rums which are aged for at least 5 years in ex-American whiskey casks. Soft and fruity with sweet vanilla and toasty oak, this is a versatile rum which is delicious served neat, but also great as a base for cocktails or mixing in long drinks- try with a dry ginger ale and a wedge of lime! Nose: Tropical fruit, vanilla, coconut and toasty oak. Palate: Initially soft and sweet with lovely dried tropical fruit flavours and a touch of sweet spice from the oak. . Finish: Dry and warming. Medium length. 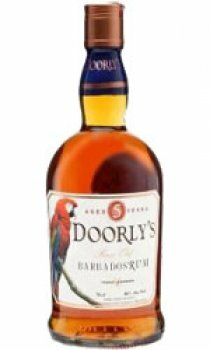 Doorly's rums are crafted in Barbados by R. L. Seale & Co- a 4th generation family-owned business passed from father-to-son since the 1920's. The Foursquare Distillery, where it is produced, was built in the 1990's on the site of a 17th century sugar factory and is one of the most modern and environmentally friendly distilleries in the world. Current head distiller Richard Seale , has a passion for creating authentic rum with great and honest flavour. Unlike many rum producers, he never adds any sugar or flavour additives after distillation, instead adopting to mature his rum in high quality oak barrels for a longer period than most to naturally mellow the spirit. Blending rich, flavoursome pot-still rum with light and elegant continuous-still rum Richard creates a range of beautiful, highly regarded and award winning rums.